• Why a Illustrator plug-in for Axialis CursorWorkshop? If you use Adobe® Illustrator® to create your images, here is how to proceed to work with Axialis CursorWorkshop using an Illustrator plug-in. Why a Illustrator plug-in for CursorWorkshop? We created such a plug-in to permit you to transfer an image or a drawing directly from Illustrator®) to Axialis CursorWorkshop through the memory. This is much more fast and secure. 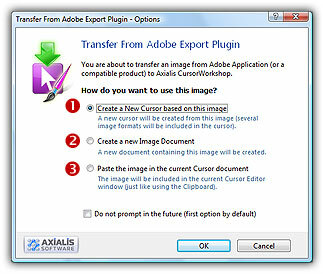 No more temporary PNG file to transfer your image into Axialis CursorWorkshop. No more risk to loose your file while transferring it. As the cursor format does not yet support vector images, during the transfer the image will be converted from vector to raster. This operation is called a "rasterization". Several options are available to adjust the rasterization. Before using this plug-in you have to install it in the Illustrator plug-ins directory. Before using the plug-in, you need to install it on your computer. It can be easily installed from within Axialis CursorWorkshop in one fast and simple operation. 2. 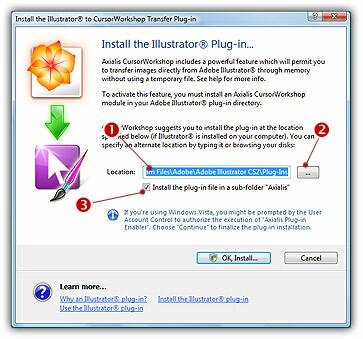 The dialog box Install the Illustrator to CursorWorkshopTransfer Plug-in opens (see below). In the Location edit zone ( ), specify the Illustrator plug-in folder. If you don't know the exact folder path, click the browse button ( ) to choose the folder in a list. 3. If you want to create a subfolder "Axialis" to install the plug-in module (recommended to organize your folder properly), activate the option "Install in a subfolder Axialis" ( ). 5. Now you can start your Illustrator® application. The plug-in is visible in Filter/Axialis/Transfer To CursorWorkshop menu. To use the Illustrator® to CursorWorkshop plug-in, you must start the Illustrator® application first. The plug-in is accessible from within Illustrator® only. Before using the plug-in as detailed in next topic, you need to install it on your computer as described above. 1. First of all, launch Illustrator® and open or create a document. 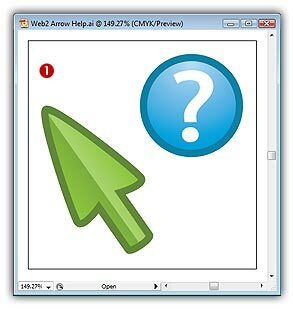 For example, open the file located in the Librarian "Cursors\Tutorials\Web2 Arrow Help.ai". 2. 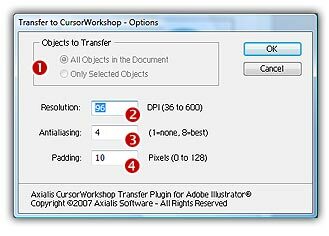 In the document, select the objects you want to transfer to CursorWorkshop. If you don't select objects, the whole document will be transferred ( ). 3. Choose the Filter/Axialis/Transfer to Axialis CursorWorkshop... command in the Adobe Illustrator menu. 4. A dialog box opens (see below). If you have selected some objects in the document, you can choose to export only these objects or the whole document ( ). 5. During the transfer, the vector objects will be rasterized (i.e. converted to bitmap images composed of pixels). To perform this, you need to specify the Resolution ( )of the image to produce in DPI (Dots Per Inch). Based on the size of your vector document and the value you specify here, the size of the final bitmap image will be automatically calculated. For example, if your vector object is 2x2 inches and if you specify 128 DPI, the final image will be 256x256. 6. Specify a value for the Antialiasing ( ). This parameter permits to create a smoother image, especially on edges. The higher, the better, the longer to compute. Finally, specify a Padding value ( ) to create a transparent border around the image. This will avoid to have the objects placed directly on the border of the image. A small border permit to create nicer cursors, especially when creating the small image sizes. 7. 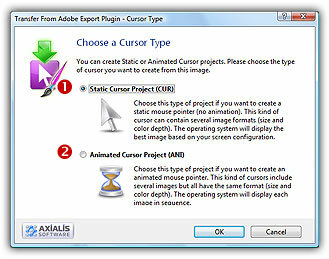 When done, click OK. Axialis CursorWorkshopis automatically launched (or activated if running in background) and the dialog box Transfer from Adobe Plug-in opens (see below). 8. The image is about to be transferred in CursorWorkshop. You can choose one of the following operations: Create a New Cursor using this Image ( ): You create a new cursor with several formats based on the image (see step 4); Create a New Image Document ( ): CursorWorkshop opens a new document containing the image. You'll be able to perform various operations on the image (resize, crop, save...) and even create a new cursor from a portion of it; Paste the Image in the Current Cursor Document ( ): This option is enabled only if a cursor document is already opened in CursorWorkshop. It pastes the image in the current editor area (just like the Clipboard paste operation). 6. If you choose the first option (Create a New Cursor using this Image), the following dialog box opens (see below). 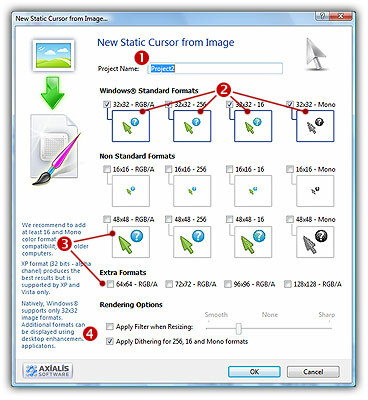 As Axialis CursorWorkshop support creation of both Windows and animated cursors, you're prompted to choose the format. Select option for a Static Cursor or option for an Animated Cursor. 8. In Project Name ( ) specify the name of the new cursor that will be created. 10. You can add other non-standard formats ( ) but they won't be used by current versions of Windows (these formats might be useful in future versions of Windows). You can also apply or not the dithering option to the 256/16 color images as well as add a filter effect to smooth/sharpen the resulting images in RGB/A mode (try and see the results in the preview images). 11. When done, click OK. The cursor is automatically created with the various image formats you've chosen. You can click on the various image formats you've created ( ) to see the results in the editor window. The automatic color reduction and smooth transparency conversion generally create a few pixel iregularity that need to be manually retouched. If necessary, do it using the available tools. 12. The last step is to set the hot spot. Choose Draw/Set Cursor Hot Spot or press K and click on the hot spot location.